Seeing people begging, and especially children, is challenging and many people are unsure how to respond. 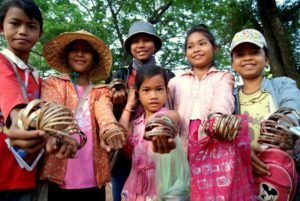 Most of the children selling things in Siem Reap don’t live on the streets; rather they are children who work on the streets. Often we think that if we give money, food or gifts to begging children, we can, in some small way, help them to escape from their current situation. Unfortunately the reality is that we play a small part in locking them into their situation. They, and/or the people who send them out to beg, are encouraged to continue begging. This prevents children from going to school, puts them at greater risk when working the streets, and the cycle of poverty can continue. There are better ways to offer support: use businesses with a social impact, such as training restaurants and shops, or donate to organizations supporting children and their families.